I feel like we haven't had much luck with the 2014 TV season - at least in terms of new shows. There aren't too many that we've considered worth experimenting with and thus we've mostly stuck to returning shows - and even then we've opted to drop a few like Revolution because it's just not going anyway interesting anymore. The Crazy Ones was one of the rare new shows that we experimented with given (1) sitcoms are low-impact in terms of both meaning and obligation and (2) Robin Williams. And while I don't necessarily claim to be a total 100% fan of the guy, I totally respect his comedic ability and his flair for improvisation. And it's been far too long since we've seen him on the small screen - and a lot of actors seem to be going back to their roots despite already having a lot of good movies under their belt. 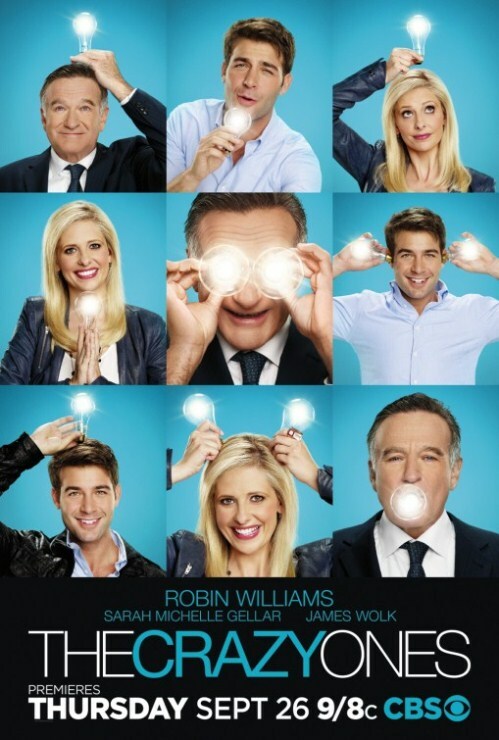 The premise behind the show seemed decent enough - the figured an advertising agency was the best place for a wild comedic character like Robin Williams to be and one that allows him to be the usual crazy, kooky self that we've seen in most of his endeavors over the years. But it still provided a decent office framework to tell other stories. Synopsis: The Crazy Ones is a US sitcom created by David E. Kelley for CBS. The show managed to complete a full season order, although I have yet to read news stating that it has been confirmed for a second season just yet. The Chicago-based advertising agency of Lewis, Roberts + Roberts is lead by the visionary (or perhaps just plain eccentric) advertising legend Simon Roberts (Robin Williams), together with his daughter and now business partner Sydney (Sarah Michelle Gellar) and Gordon Lewis (Brad Garrett). Most of the quirky office crew continue to bask in Simon's reputation for genius and creativity while Sydney continues to find her place in the world and live up to her father's name. Week after week, we watch the crazy crew dig into a new advertising campaign, typically for some major brand. In the pilot episode alone we have them trying to figure out a new marketing jingle for McDonald's and settle on the idea of reviving the now classic "You deserve a break today" song. Online research indicates that most if not all of the brands were selected by the writers and are not in fact actual product placements.This gives the production team full creative control about how the different brands are represented in the episode. There are some longer-running back story concerns that loosely fulfill the role of a meta-plot in this story. A key point is how Simon has been married and divorced multiple times while Sydney continues to have some sort of a relationship with her estranged mother. Andrew (Andrew Keanelly) is an art director who has a bit of a crush on Sydney but is also highly insecure and typically dependent on others for validation - Simon's most of all. The show naturally orbits about Simon as a central character - there's no hiding the fact that the character was tailor-fitted to Robin Williams and thus he's pretty free to let loose and be himself. This is a good and a bad thing since it means we see the parts that we love about him and the parts that just get really annoying when repeated time and time again. I'll leave you to decide which bits are which - Robin Williams' comedic career is a bit of a Rorschach Test at times. Admittedly, the biggest surprise for the show, at least for me, was Sarah Michelle Gellar. And while did somewhat see her comedic side during the main run of Buffy: the Vampire Slayer on TV, I never really thought of her as a comedy actress. And while at times she does seem like a bit of a caricature, at the end of the day it rather works and I do enjoy her scenes. She's come a long way indeed. The assembled cast is a decent enough group that manage to work together despite Robin Williams being this overwhelmingly strong personality right smack in the middle of the show. And while no one every truly shares that limelight with him fully, at the very least they do get their moments when he wanders out of the scene or something. The show is clever, but not in a groundbreaking way. It's funny, but not particularly consistent. It can indeed get rather crazy, but not always in a manner that still makes sense from a plot perspective. But I'd like to think that the show still has a lot of possibilities for growth in the future - provided it actually gets renewed. The Crazy Ones wasn't too bad a show in its first season and there are certainly parts of it that I'm growing to love. I can also see how it may not be enough to sustain the interests of modern viewers, but let's see how far it goes, shall we? For now it rates a good 3 over-the-top advertising stunts out of a possible 5.